I was beyond excited to try a recipe from Damaris’ cookbook Southern Girl Meets Vegetarian Boy! The entire book has a “Meat On The Side” quality to it, as Damaris incorporates veggies into classic Southern dishes and makes many of them completely meat-free. Choosing a recipe to make was no easy feat, but in the end I HAD to try the Bourbon Spaghetti with Pecan Meatballs. I’m a sucker for a vegetarian meatball, and have made many amazing ones myself—if I do say so. BUT, I had never seen one like this before. Damaris' recipe calls for putting raw couscous into a food processor with pecans. Then you grind it all up and add some eggs and cheese. In the end you have this perfectly dense, very flavorful meatball. And it gets even better when you bring in Damaris’ tomato sauce and bourbon spaghetti. What is Bourbon Spaghetti, you might ask? Well, you take ¼ cup of bourbon and mix it into hot pasta for a subtle warm bourbon flavor that attaches to every noodle and gives the entire dish a slightly smoky, rich flavor. Let me sum it up for you by saying it was one of the best pasta dishes/veggie meatballs I’ve ever made. And like every recipe Damaris writes, it’s easy, well-done, and the leftovers have incredible flavor for days. Congratulations, Damaris, on a truly outstanding book! Over medium heat, melt butter in a Dutch oven. Add the onions and sauté until tender, 5-7 minutes. Add the garlic and stir. Add the cans of tomatoes along with the juice and the ground bay. Simmer for 30 to 45 minutes. Remove the sauce from heat. Using a blender pulse the sauce until smoother but still rough. 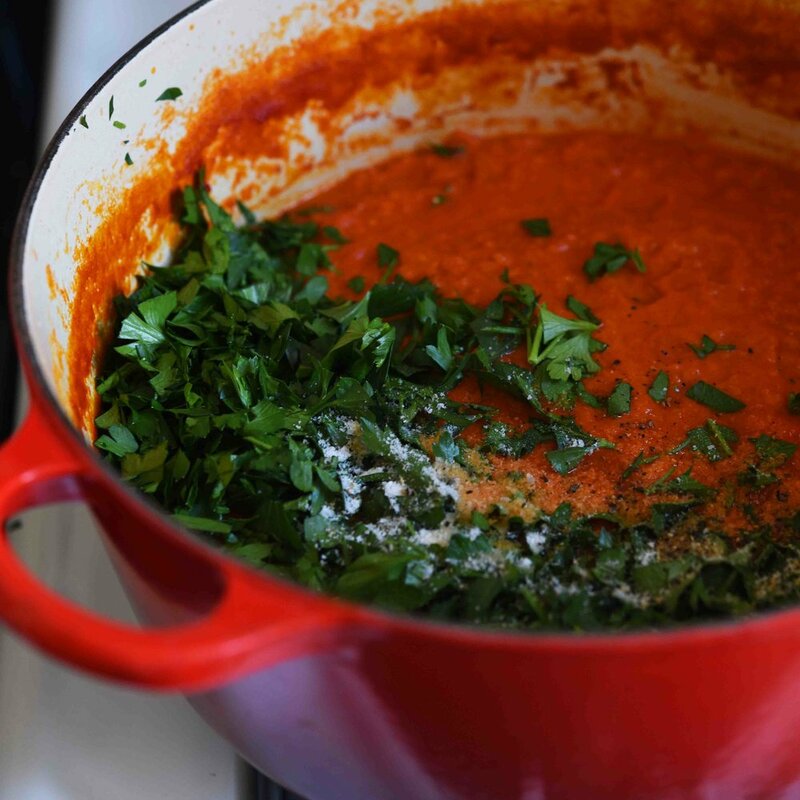 Return the sauce to the dutch oven, add parsley and season to taste. While the sauce is simmering, pre-heat the oven to 350 and spray a 9x13 casserole dish with cooking spray and start on the pecan meatballs. Add the 1 tablespoon of olive oil over medium heat in a large sauté pan. When the oil is hot add the onions and sauté until tender, 5 to 7 minutes. Stir in the garlic and remove the pan from heat and sat aside to cool slightly. Add the couscous to a food processor and pulse until a coarse mill is formed. Add the pecans, Italian seasoning, sage, red pepper flakes, 1 1/2 teaspoon of salt and 1 teaspoon pepper. Pulse to create a coarse mill again. Add the eggs and the cheese and pulse until just combined. Pour the mixture into a large bowl and stir in the onions and liquid smoke. The meatballs should be moist, but have a crumbly look to them. Heat the remaining olive oil to a 10-inch cast iron skillet over medium heat. Using the 1 ounce portion scoop, scoop the mixture into the pan, flat side down. Cook until dark golden brown, about 2 minutes. Flip and brown on the other side, another 1-2 minutes. Remove from the pan. You will get around 18 meatballs and may need to sear them in two batches as to not over crowd the pan. Place them in the casserole dish and top with 1 1/2 cups of the sauce. Bake for 30-35 minutes, until the meatballs are firm on the outside and hold together. In a large saucepan bring the water and salt to a boil. Add the pasta and cook until al dente, about 9-11 minutes. Strain. 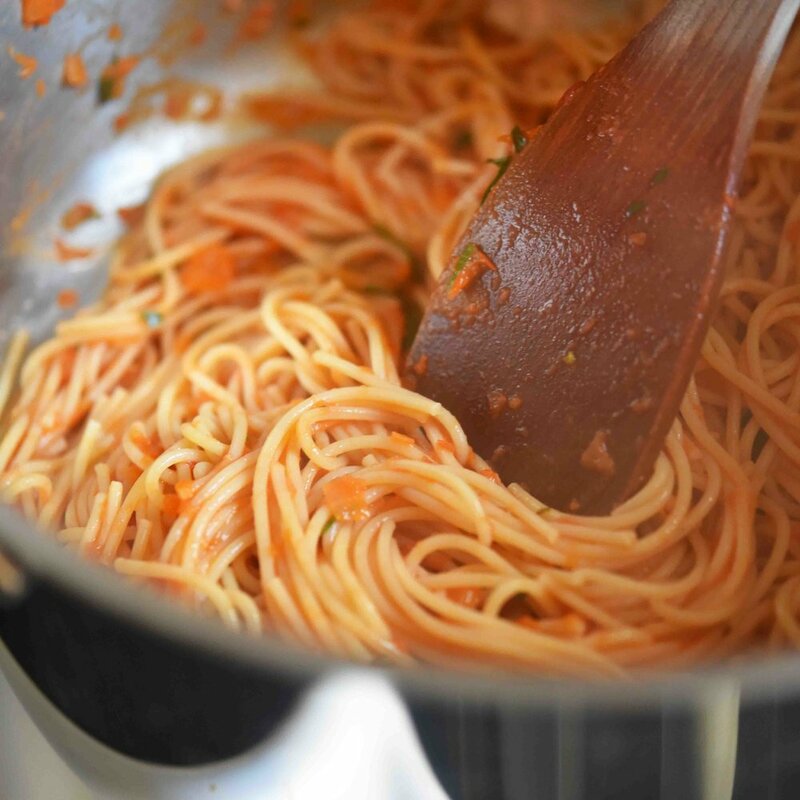 Add the pasta back to the pan, stir in the bourbon and 1 cup of sauce and toss to combine. Serve immediately by topping with sauce and meatballs. Garnish with parmesan and parsley.